Before I get to the Story of きんたろう (Kintaro) I should share with you some things that have been happening around Shaolin. 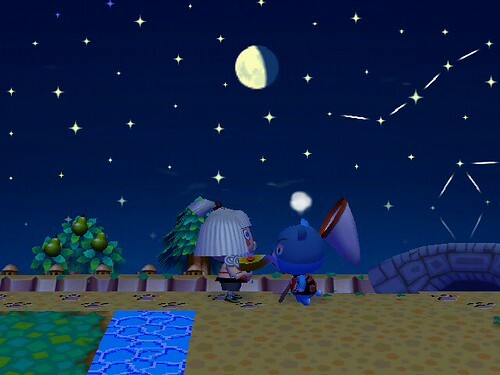 Since I hadn’t played ACCF in a while, I decided to log in to my other characters just to do some town maintenance. (Isn’t it annoying when only one character has a certain design pattern that you need? Yeah.) 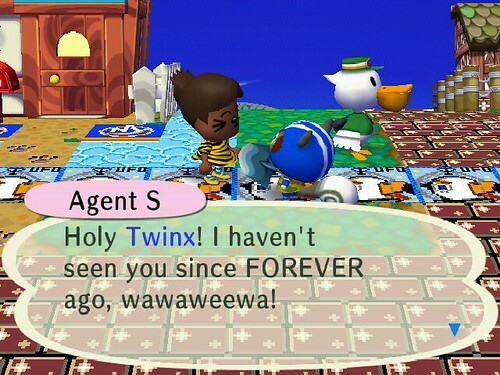 I thought it was funny that Agent S blurted out “Holy Twinx!” The rumor mills had been churning in my absence. Apollo thought King Squirt was on a retreat making a handkerchief. Who does that? A new neighbor moved to town, since Peaches finally left Shaolin. The new neighbor was a familiar face – what a pleasant surprise! Anyway, back to the main story. Today in Japan it is a holiday, called Boy’s Day. (Technically, オレンジ said it’s “child’s day” but it’s mostly for boys.) 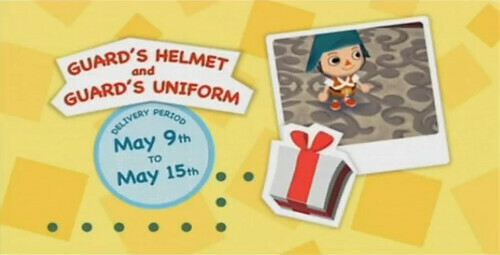 Usually on Boy’s Day, you only get a Newspaper Hat. This year, however, Nintendo stepped it up a notch and decided to release some JP DLC as well… a wig and a shirt pattern that are from a famous folk tale from Japan! The DLC is called きんたろう (Kintaro Wig) and きんたろうのはらがけ (Kintaro Apron). Who is Kintaro? That’s Golden Boy – the hero of the classic Japanese fable! (Read about Kintaro on Wikipedia.) According to the tale, “Kintarō was active and indefatigable, plump and ruddy, wearing only a bib with the kanji for “gold” (金) on it. His only other accoutrement was a hatchet.” So… check out our re-enactment! According to the tale, Kintaro was raised in the wilderness and became friends with a lot of the animals of the forest. 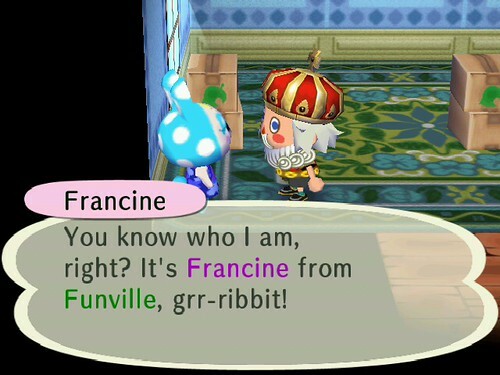 Sounds a lot like Animal Crossing, right? (Minus paying off loans and shooting down UFO’s, of course.) One big part of the tale was when Kintaro, still a young boy, was able to defeat a bear in Sumo Wrestling. There were no bears in Orenji’s town, so when King Squirt returned to Shaolin, he sought out the only bear in town. The moon was almost full. Kintaro Squirt and Kody stood eye to eye, exchanging angry stares. 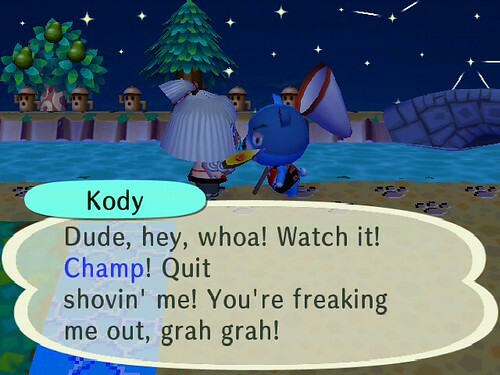 Kody made the first move – a shove! Kintaro Squirt would NOT take this lightly. He vowed to defeat Kody the Bear! Kintaro Squirt pushed and shoved, swung his axe left and right until finally…. OK so maybe Kody didn’t know about the Kintaro fable. He just kinda got pissed off and stormed away, grumbling to himself. 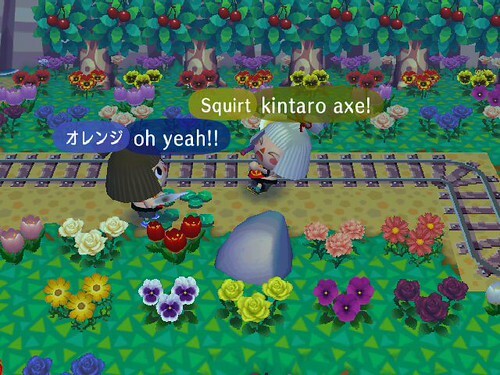 Whatever… Kintaro Squirt declared VICTORY! Wasn’t that a cute and fun DLC story? I thought so! And just our luck – the US is finally getting some great new DLC this weekend! So I will try to remember to post on 5/9 so you can all see the fun we’ll have dressed up as Copper and Booker! Looks like we’ll have some great new costumes for Halloween in 2010 lol!